JULIA SPENCER-FLEMING: Most of you know by now that Jeff Cohen (and his elusive counterpart, E.J. Copperman) is a good friend of mine. What you may not know is that Jeff is also very close to my husband, Ross. They didn't bond over baseball - as respectively serious Yankees and Red Sox fans, it's surprising they haven't come to blows yet - instead, they connected over autism. In the years since Ross started teaching special ed, he had seen a yearly rise in the number of kids diagnosed with autism and Asperger's syndrome (now redefined as autism spectrum disorder.) Ross had been attending continuing education classes on the subject and doing lots and lots of reading on the side. His experience influenced my third novel, where the mother of an autistic son refuses to have her younger child vaccinated. When Jeff and Ross get together nowadays, they don't spend as much time talking shop - the autism spectrum kids in Ross's school are well-integrated into the programs, and Josh is a graduate of Drexel University's film and video program, looking for a full-time job like approximately 800,000 other twenty-five-year-olds. The numbers are staggering. Now it’s estimated that one in every 44 children born in America has behaviors that would identify somewhere on the autism spectrum. That’s a huge statistic. And the behaviors range from some mild social anxieties to an inability to communicate and beyond. There are so many shades of color on the autism spectrum that a rainbow is far too inadequate a metaphor. 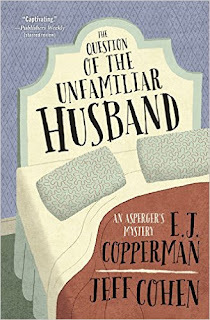 But I/we write books I’m hoping will make people laugh, and in the Asperger’s mystery series (astonishingly about to continue with The Question of the Unfamiliar Husband), the narrator and central character has a form of autism called Asperger’s syndrome. Although he doesn’t have that at all because the American Psychological Association has decided there is no such thing as Asperger’s syndrome. So obviously Samuel Hoenig is cured and we need to change the name of the series. Glad we cleared that right up. Anyway, until the APA made its decision last year, Samuel had Asperger’s, and he was diagnosed with it when he was in his teens. He’s now in his early 30s, I believe, although I’d have to go back to the series bible to be absolutely sure, and you don’t want me to have to do that, do you? The point is, autism is not a laughing matter. Families are strained (and in some cases destroyed) by it, people who have it can experience innumerable difficulties and suffer anything from slights at school to clinical depression because of their differences. It is something that requires serious thought and consideration, research and empathy. Autism is not something to laugh at. That presents something of a problem when trying to write a funny book with a narrator who has a form of autism (no matter what they’re calling it this week). But it’s important in the Asperger’sMystery series never to make fun of Samuel’s autism. Under no circumstances would that ever happen. Of course, that doesn’t mean I can’t have some fun with the way some people react to Samuel’s autism. The comedy in that series is to see how some characters will respond when Samuel insists on conducting an interview while striding the circumference of his office, thrusting his arms above his head and trying to work up a sweat. His regiment insists on exercise every twenty minutes during the working day, and nothing will dissuade Samuel from that activity. So I let him go and watch the other characters as he races around the room. Their reactions are (hopefully) funny. His “eccentricity” is not. Samuel also notices idioms and turns of phrase that many of us take for granted and wonders either what they mean or why they came to be at all. Tell a person with Asperger’s (see previous parenthetical expression re: name of disorder) you’re “just pulling their leg,” and you’ll almost certainly be asked why someone would want to do such a thing. The Asperger’s books are not intended to be joke machines, like some previous series I’ve written (and future ones I might write). Samuel’s point of view is the focus, not being hilarious. But if you think I’m going to deliver a serious, dark, depressing view of a man with a tragic disorder, you have come to the wrong place. Samuel doesn’t think his little corner of the autism spectrum is a jail cell; he believes it to be his own haven from the madness that goes on around him (that’s most of us). While not an unrealistically upbeat or saccharine kind of guy, he will not wallow in self-pity. Frankly, he believes most people act in ridiculous, borderline psychotic fashions. And if you read the daily newspaper, it’s hard to argue with him. E.J. 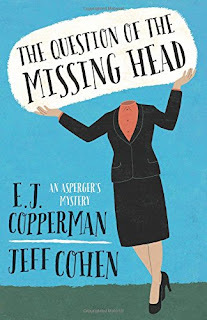 Copperman/Jeff Cohen, either or both, write(s) the Asperger’s Mystery series, which continues (from The Question of the Missing Head) on October 8 with The Question of the UnfamiliarHusband. It might make you laugh. But not at autism. You can find out more about the Asperger's Mystery series, and read excerpts, at E.J. Copperman's website. You can also peruse his blog, Sliced Bread, friend him on Facebook, and follow him on Twitter as @ejcop. You can explore all of Jeff Cohen's books at his website, friend him on Facebook, and follow him on Twitter as @jeffcohenwriter. 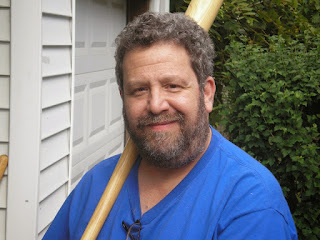 Jeff also blogs at There's a Dead Guy in the Living Room, which, along with Jungle Red Writers, is one of the longest-running mystery blogs on the internet. So glad the series does not "deliver a serious, dark, depressing view;" sometimes the world is truly scary, complex, difficult, and strange . . .
Congratulations on a great series; I'm looking forward to reading Samuel's further adventures. So interesting, illuminating... and I don't know how I've missed E. J. Copperman books, will have to remedy that since I'm a fan. Autism seems mysterious and scary from the outside. In NY I recently saw the amazing play based on The Curious Incident of the Dog in the Night Time, the novel by Mark Haddon. The staging (the stage is set up like a black box) takes you literally inside the main character's head. Wondering, Jeff, if you saw the play (or read the book) and what you thought of it. Wow, this is fascinating -- need to catch up on the E.J. Copperman books. My husband, who's developing an online show for kids with autism, will be interested as well. Having met Jeff a couple times now at Malice (he probably would not remember me), I know he has a wry sense of humor, too. His books have been on my list of ones to look for since the first time I met him, but you know how it is with Mount TBR. However, knowing the subject matter of this series pushes it to the top of the list, especially now that I know the background of this series. My favorite nephew has three daughters, ages 13, 9 and 4, and the two oldest have differing degrees of autism, prompting my nephew's discovery that he, too, has Asperger's. His wife quit her job in social work to begin working with autistic kids at the elementary school level, and she's written a lovely essay about living with an autistic husband. Their family has had many challenges, but they approach them with great humor, which makes such a difference. Shari is a great reader, too; I will definitely recommend the series to her. My autistic friend is 12. We chat over the backyard fence, though our conversations are one-sided and repetitive. He knows my name. He looks at me, sometimes. We talk about music. A serious subject doesn't need to be treated with "a dark, depressing view." In every aspect of life there is humor. I have a friend whose son is autistic (although really, in my interactions with him he seems like a pretty normal teenager). They do a lot of laughing - not at the condition, but at life around the condition. oh yes we are all neurotic Mary:). I love that Samuel has discovered this exercise plan helps him--I was just reading an article in the NYTimes science section yesterday about how important it is to move around EVERY HOUR. Karen, your nephew's family sounds like they are handling these problems with such grace! I meant, "regimen," I swear! Ross and I actually never argue about baseball. We are the exceptions that do not prove the rule--we respect each other's sports insanity for what it is and move on. There is no gloating, no trash talking and no spite. Some day we must go to a Yankees/Red Sox game at Fenway, where I've never been, together. And see if all that stays true. Susan, Noel would find Jeff's nonfiction THE ASPERGER PARENT useful as well. I'm delighted to hear he's developing a series for kids on the autism spectrum; as the comments so far attest, almost everyone knows a person with Asperger's or autism. In addition to Jeff and his wife, Ross and I are friends with two other couples who have now-adult children on the spectrum. Just to be completely accurate, Julia, we should talk some sense into parents who think getting the diphtheria or whooping cough vaccine will give their kids autism. It won't. But I applaud the sentiment. Congrats on the series--I can't wait to read it. I must have missed this series the first time it came around on JRW; that title alone has put it at the top of my TBR pile! My nephew's 2 year old has just been diagnosed as ASD--she's a curly-haired giggle-box who loves to read--and she likes to sit on my lap--love every inch of her. Look out World--Chloe's gonna reach for the stars and sprinkle them over our heads!! There are several theories, Deborah, including the idea that diagnosis has gotten better. It's speculated that such figures as George Washington, Mozart, Einstein and others were on the spectrum. But it definitely is not caused by vaccines. Loved the Haunted Guesthouse series; and as others have commented, the titles alone have roped me into this second series. Thanks for the uplifting post, Jeff/E.J. I don't know how I have missed these! Can't wait to start reading them. 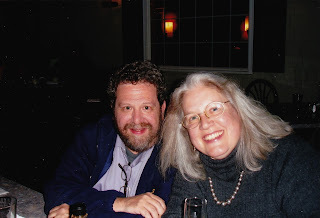 My son, now a senior in college, was always termed "right on the edge of the spectrum," but as he was growing up we knew several families with children -- most often sons -- much more definitively on the spectrum. Most have made a successful transition to adulthood and found paths that work for them, though I do have one friend whose son is turning into the stereotype we parents of these kids always fear: "He's going to live in my basement forever." He is brilliant and capable but has not found a way to advance through the required milestones of adult life. Things fell apart for him when he tried to transition from middle school (with kids he had known since kindergarten) to an unfamiliar high school, and he has never been able to get back on track. I am heartened by the fact that today's young people know so much more about the spectrum. It is my observation that they are actually a lot less likely to make fun or reject someone once they realize WHY they are being "weird." And thanks for reiterating, over and over again, the complete and utter lack of any documented link between vaccinations and autism. I'm going to seek out E.J. 's books as well. It's funny how these things happen: I had never really thought about characters with autism (at any point of the spectrum) until I recently read Belinda Bauer's RUBBERNECKER, about a young Welshman who has Asperger's (I guess they still call it that in the UK). Lots of dark humor, not at the character's expense, but more at the expense of the other characters doing their best to interact with him. The character, Patrick Fort, has been accepted in an anatomy course at the Cardiff medical school and realizes that the cadaver he's dissecting was murdered. He's right, of course, the trick is convincing the skeptics that surround him. My daughter, who is now 31, majored in special education in college with an autism specialty. She worked that the university's autism center while an undergraduate, too. When she graduated, she began working on a Masters that focused on autism and became administrator of a branch of the university's autism program. She put that work on hold when her daughter was born, but I'm hoping she returns to it, as she was very good with the kids of different ages and different diagnoses. My daughter's involvement got me interested in seeking out fiction with autism in it. It was rather early days for that fiction, but I enjoyed The Curious Incident of the Dog in the Nighttime and a few others. I'm delighted to hear of your series, Jeff, and I will be adding it to the towering TBR pile. I like that you include humor in it, as laughter is a dealing and healing tool for all of us. And, Jeff, The Haunted Guest House series sounds right up my alley, too. I am so late today! But none the less so thrilled to see you here..You are incredibly brave and thoughtful..and your books make such a difference. Plus, you are hilarious. ANd hilariously talented. Oh, Hank, you flatterer. No, please, keep going! But of course only someone incredibly talented could confidently make such a statement. You're the best. Fenway? Next year? I'm IN! But don't expect me to root for the home team. P.S. Brave? I hire a guy to come get the raccoons out of my garage. Brave?